Handpicked for perfect colour harmony. 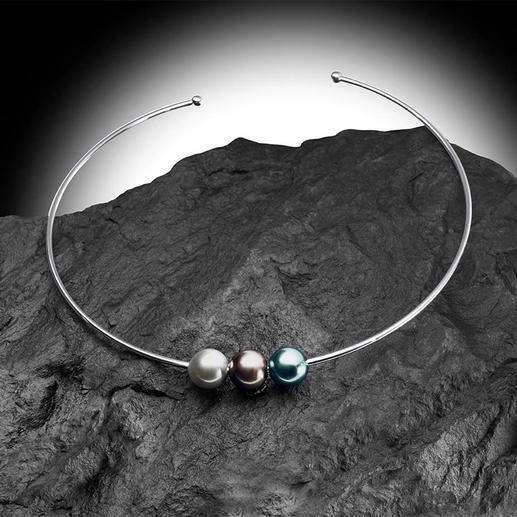 Necklace with Tahitian cultured pearls in perfect colour gradation. By limiting the colour graded Tahitian pearls to only 3, and with filigree silver, the eternal classic is transformed into fashionable jewellery in accordance with the current minimalist trend. Sophisticated and suitable for everyday use. This necklace looks just as classy combined with a little black dress as it does with a pair of jeans. From the numerous metallic shades of Tahitian pearls, a platinum coloured, a grey/green iridescent and a charcoal grey pearl were selected. In addition to the depth and brilliance of the colour, the size of the pearl, the purity of the surface and the even shape all to its value. The biggest and most beautiful Tahitian pearls worldwide are cultured on farms in French Polynesia. The black-lipped oyster “Pinctada margaritifera cumingii” has the ideal habitat in the warm waters of the South Pacific. Made from 925 sterling silver with 3 pearls, each with a diameter of 10mm.